Are these racks stable enough to stack 3 or 4 high on carpet? Yes, but anything more that 3 i would recommend reinforcing to the wall. I think so. The weight of the wine makes them more stable. Yes. Love them. You will be happy with their stability. Will turley bottles fit on this rack? BEST ANSWER: Any standard wine bottle can fit on the rack. Yes a turley will fit. Can this wine rack be mounted to a wall? BEST ANSWER: No, the 18 Bottle Stackable Wine Rack Kit is designed to rest on a flat, level surface, such as a floor or counter top. As it is 12" deep assembled, it could rest on a properly sized and supported wall shelf. I have a space on top of my refrigerator that is slightly more than 13.5 inches of height. What is the height from the bottom of the rack to the top of a bottle on the top row? BEST ANSWER: If a bottle is racked on top, the total height is about 15". Is it possible to buy only one rack (I already have a double and only need 1 additional rack, not 2)? Sorry, this rack comes factory packaged as a set only. Can I stack 2 sets (4 racks) on top of each other on wood floor? You had mentioned you would not recommend more than 3 racks on carpet. What about wood? Thanks! BEST ANSWER: Thank you for your inquiry. If you stack more than 4 racks I would consider anchoring to the wall as I would worry about the stability and the weight involved. If you have any further questions, feel free to reach out to us at 800 356 8466. Thank you again. Can the two racks, holding 9 bottles each, be separated? I only have 8" of height to put in a wine rack and the 11.25" total height of this rack would not work, but if separated in half it would work perfectly. BEST ANSWER: Yes they can be separated. BEST ANSWER: Hello, thank you for your question. The 18 Bottle Stackable Wine Rack measures 11-1/4" in height (taken from the base and includes the two racks stacked on top of one another), 34" in width, and 12" in depth. Thanks again. Will larger Burgundy or Pinot Noir bottles fit on these racks? BEST ANSWER: Great question. 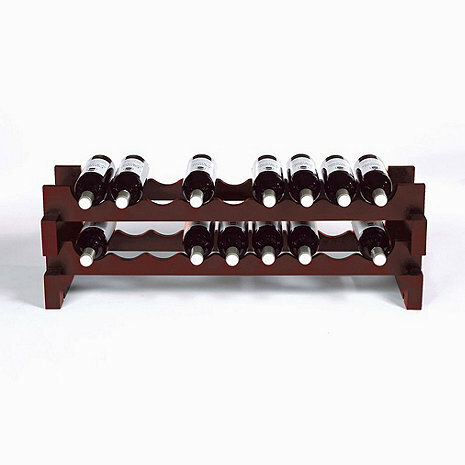 Larger Burgundy and Pinot Noir glasses will fit on the 18 bottle Stackable Wine Rack. If you have any other questions, please feel free to call us at 1-800-377-3330. This is my second review of this product. I now have 7 sets of these racks, all with the mahogany finish. As many have said, they are rugged and practical, but if you value the appearance of your wine labels I would suggest buying the unstained version. The mahogany stain will mark a label, like a purple crayon, if it comes in contact when you pull a bottle out of the rack. Just as pictured, easy to put together and fits great in my space. Saw the comments on putting together but we had no problem at all. The spaces are a bit of a tight fit for large bottles such as Champagne or Pinots so that you can't put in a whole row of those side by side, but it works to mix them in with others. Overall, it looks really great and holds my ready to drink wine in the kitchen. This unit is functional and easy to assemble. Do not expect heirloom quality or fine craftsmanship. It is machine made and dyed. Would be better priced at $40-45. Turley bottles will fit. Great wine rack - exactly what I needed. I wanted a way to use wasted space in a console cabinet, and these racks were perfect. Stacked two units to provide storage for 36 bottles, and the quality of these racks gives it a finished look. Out of the box and setup in 10 minutes. Purchased 2 sets and will be adding another. Works perfectly under a kitchen counter for the wine storage. Easy setup, classic design, good price all make for an outstanding product. love the 18 bottle wine rack. beautiful. This rack was so easy to put together and looks beautiful. Great value! We ordered two racks. They are attractive, sturdy, and fit in our closet shelving nicely. They meet our needs. This was a gift to newlyweds. They like it very much. Perfect for the space! Love it! The 18 bottle rack fits perfectly under my buffet in the doing room. I wanted to use the space more efficiently. I have an Italian theme and it’s the perfect combination of classic and rustic . Highly recommend. I actually put it together without an issue. Not my forté. I was pleasantly surprised and thrilled to receive my wine rack very quickly after I ordered it (I think it took 2 days). The product was in perfect condition. Very happy with the product and with Wine Enthusiast. I would definitely order from them again. This is an excellent small wine rack. Well made. Rugged. Mine fits conveniently on a shelf inside a closet. The rack is great, easy to assemble and it looks great!!! Beautiful, sturdy, perfect wine rack! I turned a small bench area in our mud room into attractive wine storage by stacking three of these wine racks. Looks great, and now I have a convenient little wine cellar just off my kitchen. This was exactly what I was looking for! Nice product that holds 18 wine bottles. Very attractive and easy to put together. I use it for wine that eventually is moved to proper celler. We have a circa 1970's wood bar with an open back and were having trouble finding a rack to hold wine bottles (they were all too tall). These fit perfectly and are very attractive. We can even add a few bottles on top of the top row. I have a combination wine celler and music studio, it is great to have friends over to play and listen to live music while sharing a bottle of wine, the wine racks add a touch of class. Nice solid racks that are very stackable. The dowels that connect the units are a tight fit which makes for sturdy stacking. I used them to turn an armoire into a wine cellar and filled the whole piece with these racks. Looks great with the dark stained wood. 1 - bottles can easily slide out if you try to move it when loaded. This product fits in many places for easy storage. [...] easy to put together. Advise adding a little carpenters glue to pegs. This is my second purchase of the same product. I now have two racks put together for a wine storage of 36 bottles. You could stack them 4 high if you wanted. It's easy to put together, attractive and sturdy. It looks great in my living room and I do use it. I have 24 bottles of wine that will go from this storage rack into my wine chiller in time. Delivery was prompt and arrived intact. Delivery was very prompt, much faster than estimated. Not furniture quality, but certainly functional. Finish is more like a paint than a stain. Sturdy and stable at a four layer high stack. Works well for hidden storage. Issues as previously commented related to the poor sanding and uneven stain quality. I purchased 3 and they were all the same. Not pleased - the paint/stain finish was not at all similar to my previous purchase of the mahogany request. I will not be making any similar purchases.